Brazil are the pre-tournament favourites after an impressive run of results in the last 12 months. Fancy the Seleçao to get their World Cup campaign off with a win? 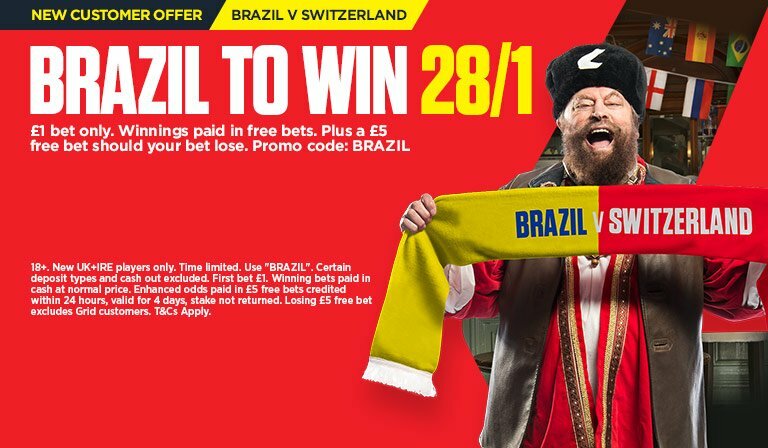 Claim a 28/1 price boost on Brazil to beat Switzerland at Ladbrokes, plus £5 free bet if you lose! Brazil are currently ranked as the second-best team in the world by FIFA and 5/1 favourites to win the tournament outright. They qualified comfortably after topping their table with 41 points having lost just one game. Don't miss the chance to make a £28 profit by staking just £1 on Brazil to beat Switzerland! 28/1 Brazil to beat Switzerland! Ladbrokes offer 28/1 Brazil to beat Switzerland + £5 free bet! Register a new account with Ladbrokes before the kick-off (7.45pm) and claim 28/1 Brazil to win the 2018 World Cup match against Switzerland - What an insane price boost!! If Brazil get all three points, Ladbrokes will settle your bet at the original price immediately. They will top up your additional winnings within 24 hours. Should you lose your bet, Ladbrokes will refund you with a £5 free bet! Get 25/1 Brazil to beat Switzerland with Paddy Power! New Customers can get Brazil at an enhanced 25/1 to beat Switzerland. Max Stake £1. Winnings paid in free bets, valid for 7 days, only deposits with cards/Paypal count. Exchange and multiple bets excluded. T&C’s Apply. 18+|Gamble Aware. 25/1 Brazil to beat Switzerland! Get 25/1 Brazil to win vs Switzerland with Betfair! 888sport offer 80/1 Neymar, 100/1 Messi or 125/1 Ronaldo to win the Golden Boot at Russia 2018! Max bet £5! Brazil qualified comfortably after topping their CONMEBOL group with 41 points having lost just one game. Tite's side have only lost two of their last 30 matches and have kept clean sheets in each of their last five. The Canarinho have allowed just two goals in the last 11 outings. The Seleçao have won all 4 friendlies in 2018 - beating Russia (3-0), Germany (1-0), Croatia (2-0) and Austria (3-0). Ladbrokes are offering all BetAndSkill readers a monster price of 28/1 Brazil to win vs Switzerland, click here to get your massive enhancement in few simple steps! This promotion is open to UK and Republic of Ireland residents aged 18 years or above. It is valid until 20:00 17/06/2018. If Brazil win you’ll become eligible to enhanced odds of 28/1. If Brazil fail to win, Ladbrokes will instantly credit your account with a £/€5 free bet. Price boost is NOT available to users depositing funds with Moneybookers, Paypal, Paysafe, Neteller or Skrill. Please use credit or debit cards. "28/1 Brazil to beat Switzerland at Ladbrokes (World Cup price boost)"